The ultimate goal of a water quality team at a Koi show is to return the exhibited fish to their owners in as close to the condition they were in when they were delivered. Without the advantages of some of the sophisticated “flow through” systems in use in the Pacific Northwest, made possible by cell venues that have not only excellent water supply but also extraordinarily convenient drainage, those of us here in the Midwest are thrown back on the system originally developed by Norm Meck for his spectacular shows in San Diego. The main reference for his techniques are outlined in his article January/February 1998 issue of Koi USA. Shortly after the publication of this article, Anne and I went out to San Diego and joined Norm’s water quality team. This was almost the last Japanese-style koi show held in the United States. Shortly afterward, KHV devastated the Hofstra Koi show and effectively put an end to Japanese-style shows. Norm’s article deals with the Japanese show and, to my knowledge, there have been no updates since. This article will take the reader through the sequence of events leading up to a British-style show, then through the show prep, load-in and maintenance, all the way to check-out and delivery of the fish back to their owners. Yeah, I know it’s freezing out there, but now is when you need to start making lists and getting your materials together. If you have decided to get a Show sponsor to help with expenses, now is when you need to be calling them. There are a load of other shows out there, and only a limited number of vendors with the resources and willingness to sponsor. Get on the computer, fire up the email and get going. If you do it right, your major chemical expenses can be next to nothing. Go back over the records from the previous year and decide if what you had to work with was enough. Make the adjustments you need, always working with your Show Chairman, so there are no surprises. It is no fun to show up and see ten additional vats that you hadn’t planned for awaiting your attention. Don’t ask what overnight shipping on ten pounds of ClorAm-X costs. Fedex will love you. Your budget will not. Enough powdered ClorAm-X (or equivalent) to treat every vat initially for 2 ppm “cushion” and additional 1 ppm doses as needed to handle the ammonia produced through the show by the fish. Depending on loading, stress levels and length of pre-show fasting, this can range from zero for a lightly loaded vat to as much as an additional 4-5 ppm for a crowded vat containing Moby Koi and her mother, Kong. Enough fresh salicylate-type ammonia test reagents to take you through the show. Order these to arrive 2-3 months before showtime. Use whichever brand you are most comfortable with. Mydor makes a nice, fast 2-step kit, but it has a limited shelf-life. I like LaMotte. It’s a three-step process and is a little slow, but the major vendor (Aquatic Eco-Systems) tracks the lot numbers and can give you the date of manufacture if you call them. Ammonia standard. You can make up your own if you can get ahold of dry ammonium chloride and a micrometer balance and do the math and… I get a standard solution of 150 mg/L ammonia from Hach in Loveland, CO. It has a five-year shelf-life and is much easier to deal with. A gallon jug of distilled water for rinsing tubes and pipettes, and for making up your ammoniastandard. Test tubes, pipettes, graduated cylinders, buckets, tube racks, disposable cups, pitchers,dishwash detergent, paper towels, markers, note pads, scales and whatever else you’ll need to doyour job. Your record book with enough vat spreadsheets to match the number of vats you are managing.OR an iPod with Todd Wyder’s nifty new Show Management software (currently indevelopment). A battery-powered drill with a beater head from the kitchen clamped into the chuck. This maybe your most important piece of equipment. The rest of your pond test kit. Your eyes, ears, nose and brain, all in full working order. Two weeks and counting. . . .
Having gotten the final vat count from your Show Chair, it’s time to pre-measure the chemicals. The goal of the exercise is to prevent any ammonia from touching any fish. To this end, we pre-treat each vat to provide 2 ppm of absorptive power before the fish go in and test with a titration procedure through the show to track the rate at which the cushion is being depleted. Measuring out the doses at the show is impossible. You’ll need to prepare in advance. A free morning when you can sit outside and do this. To remove 1 mg/L (1 ppm) of ammonia, 1 gram treats 8.3 gallons. Wearing your dust mask (you really really don’t want to breathe this stuff) weigh out, seal and store enough 2ppm bags to treat all your vats once, and enough 1ppm bags to treat all your vats 4-5 times. Do this outside on a fairly dry day. The chemical is vigorously deliquescent (look it up) and will weigh more in high humidity the longer it is exposed to the air. You won’t use them all. That’s okay. They’ll keep ’til next time you need them. If you choose to use this product, you’ll need to order 1/5 more than you were planning on. Given the ammonia preload given us by our friends at the Metropolitan Water Reclamation Department of Metro Chicago, which ranges from 0.5ppm on a good day and up to 1ppm on a bad day, we’ve started preloading our vats @ 3ppm. section of the cylinder. There are two formulas for this: Norm’s quick-and-dirty estimate, which we mostly use and which slightly overestimates the volume, or the actual math, which corresponds to SCIENCE. The only reason this works is that the vats aren’t perfect cylinders. They bulge, and the extra volume in the bulges makes up for the short measure on the stick. Ann Meck put t-pieces on either end of the pipe so it could be used to whap out the edges of the vats for filling. One end for 6 foot, the other for 8 foot. A marvelous tool. Go make yourself a bunch! On arrival at the show venue, set up your gear first. Make sure you have everything you’ll need, where you need it. Then start with the vats. Bully the Show Chair into giving you at least one 6-foot vat for your use alone. No fish will ever see the inside of that vat. It will serve as your source of water for the dosing procedures during the course of the show. Keep it netted. It is yours. Get a sample from it, untreated and fresh from the source. Label it “Source water” and test it for ammonia, along with pH, alkalinity, chloramine, chlorine and pH. Get a water temperature while you are at it. You may get a nasty shock when you do. Make up an information sheet with these values and give them to everybody who has anything to do with fish, ESPECIALLY THE VENDORS! As part of the preparation for the 2013 MPKS koi show, we pre-treated the show vats with the 2 ppm (AmQuel/ClorAm-X/ProAm-X) ammonia “cushion” recommended in the article published in the inaugural issue of Koi Keeper. As we proceeded with our routine pre-show testing, we noticed that our test runs in multiple unpopulated vats were “breaking” at tube 4, indicating that at least 1.0 ppm of our ammonia cushion was gone before any actual fish hit the water. The water treatment we used (ProAm‐X from Pro Line) may not be binding the ammonia “instantly” asit claimed on the label and our results may reflect an inadequate “dwell time” prior to testing. Water treatment at the hydrant source (Metropolitan Water Reclamation District of Greater Chicago)includes chloramine (NH4‐Cl) which preloads our source water with ammonia. To test this, we tested source water for chloramine, finding at least 1.0 ppm of this compound in the source water. We collected samples from a random, untenanted vat and allowed the ammonia standard to dwell for 5 and 10 minutes. The results were the same in both runs, with the “break” consistently occurring at tube 3 or 4. Adding an additional 1 ppm cushion to the vat resulted in a slight break at tube 5.
using the salicylate method ammonia test kit from LaMotte, ammonia. Not surprisingly, we obtained a value of 1.5 ppm from this test. The conclusion to be drawn here is that water pretreatment with chloramine at the municipal water source constitutes a significant pre-show ammonia load and must be measured and accounted for in your show preparation. Your vendors must also be notified of this preload so that they can pre-treat their vats appropriately and avoid losses to their stock. Chloramine levels can vary significantly from year to year and from day to day, based on water temperature and organic load in the source water. Two six-foot vats will be reserved for net and bowl (and hand!) disinfection. Bleach (which must be renewed each day) or benzalkonium chloride can be used as disinfectant. BK is easier on skin and is stable, but is way more expensive. Bleach is effective at about 200ppm, or about 5 oz per 10 gallons water. This averages out to 1 gallon in 250 gallons water, renewed on each day of the show that nets and bowls are in use. This vat is clearly labeled : BLEACH!!!!. The second vat contains sodium thiosulfate at a concentration of 1 gram/10 L water (12 oz per 1000 gal or… well you do the math. You’ve got one of Ann Meck’s tools, dontcha?). This vat is labeled: RINSE!!!!!!. If you are feeling wealthy, benzalkonium chloride (BZK) is easier on the skin and gear, is relatively koi-safe and does not have to be “boosted” every day. The rinse vat is water only. It is available in solutions of 50% strength from nationalfishpharm.com, (about $125.00 a gallon or $21 per pint). A concentration of 1000ppm is recommended for rapid disinfection. This works out to 1800cc or 60 oz (about 2 quarts) in 300 gallons water. A gallon should last you 2 shows. Better yet, housekeeping supply companies sell “Lysol No-Rinse” disinfectant in gallon jugs for not very much money. It is a 10% solution of-you guessed it-benzalkonium chloride! 1 gallon added to 512 gallons of water makes up the 200 ppm solution we need. This concentration will disinfect a net or vat or pair of hands with about 1 minute of soaking. It’s soapy stuff. Add it to water, not the other way around. Rinse in water. Label your vats. By now, the vats should all be numbered. 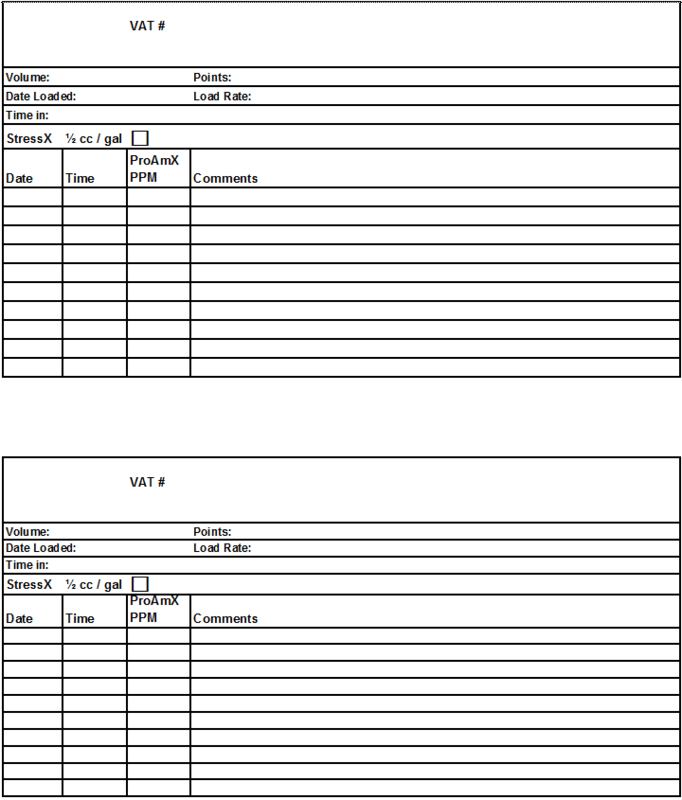 Make up a record for each vat, using the form on the penultimate page of this article. Take a 8-12 oz. sample from your source/reserve vat, label it “source water” and set it aside. Each vat is now pre-treated with ½ cc/gallon of Stress-X (or Novaqua), followed by 2ppm of ClorAm-X (ProAm-X). The liquid Stress-X goes in first and is recorded on each form as it goes in, along with the time and date. The powdered material must be dissolved prior to dosing, and here’s where that pitcher and power drill with the egg-beater comes in. Since there are no fish in residence, the isolation procedures you’ll use for the rest of the show aren’t necessary here. Dip out a half-pitcher of water from each vat, dump the powder into the pitcher and mix it thoroughly before dumping it back into the vat. Record this in the “Amq” (Amquel) column as “2ppm” next to your “Nova” entry as you do it. This prevents double dosing or missed vats. Collect a 12 oz sample of treated water from any vat (you treated your source vat, too! ), Set it aside. source water and your vat standard. There will probably be some chlorine and/or chloramine in the untreated water unless your show is running off well water. It should not be present in the treated vat standard. There should be NO AMMONIA ANYWHERE. Check to make sure that the air system is working well, do your dishes and call it a day. Your first task is to prepare your ammonia standard. The goal is to provide a single drop of standard that will create a concentration of ammonia of 0.25ppm in 5cc of distilled water. Since the surface tension of water and the force of gravity don’t vary much, most dropper bottles deliver a drop of a size such that 115 drops equals 5cc. If you can find a bottle that comes close to this, you are good to go. I found an excellent specimen in the 60 cc capacity bottle that contains the #1 Saliclyate reagent for the LaMotte Salicylate ammonia test kit. We tested this bottle repeatedly under show conditions, and it came out at 115 drops per 5 cc each time. Given the above drop size, you’ll need 50cc of standard solution at a concentration of 29ppm. If your head has not yet exploded from the math, you now have your ammonia standard. Label the bottle with the exact directions for making up the standard so you NEVER HAVE TO DO THE MATH AGAIN! Now it’s time to test the standard and your ammonia test kit. Set up 5 test tubes in one of your racks with 5cc each distilled water. In each successive tube place 0,1,2,4 and 8 drops (0,0.25,0.5,1.0 and 2.0ppm) of ammonia standard. The zero tube is always “tube 1”. The 2ppm tube is always “tube 5”. Mix. Run your ammonia test, mixing between steps. Compare with the test comparator for accuracy. If you don’t have a nice rainbow, either your standard or your test kit is bad. A full line of zero ammonia indicates a failed test kit. Other abnormalities, such as 4+ ammonia everywhere, suggests that you goofed up the prep on the standard. At the same time, get a sample from any one of the empty vats, or from your vat standard. Set up 5 tubes containing 5 cc each. In each successive tube place 0,2,4,6 and 8 drops (0,0.5,1.0,1.5 and 2.0ppm) ammonia standard. The zero tube is always “tube 1”. The 2ppm tube is always “tube 5”. Mix. Run your ammonia test, mixing between steps. This tests your vat’s protective cushion against ammonia. You should not see any color change in any tube except possibly tube 5. This reflects a 2ppm ammonia safety margin. Remember to use the first set of tests you did with the distilled water as your comparison standard. It’ll be more accurate than the cards or slides that came with your kit. You will be using this last titration technique over the course of the show to monitor conditions in the show vats. You will be loading a set of 5 tubes with a water sample taken from a vat with fish in it. Each vat that you test will have a cup or other suitable container labeled clearly with that vat number and it is EXCLUSIVE TO THAT VAT. The sample is taken in such away that only the cup comes in contact with the water to avoid cross-contamination. Keep the cups at your station, re-use them as needed. This is the central principle of this entire exercise. Anything that happens to any given vat should be recorded on the spreadsheet assigned to it. This includes titration results (specifically the tube “break” number), any chemical added to the vat with time and date, and any unusual occurrence (spawning, flashing, stress, jumping, relocation or other events) . The totals of the ClorAm-X dosing from prior shows allow you to plan for the next one. One member of your team is generally the record keeper. He or she will generally have the best idea of potentially troubled vats based on load ratios and prior dosing. We sample one or two of the most heavily laden vats, one “mid-range” vat and at least one lightly-loaded vat at the beginning of the show. Further testing is done as needed, based on the circumstances that arise during the show. (Irritability or odd behavior, spawning events with the fish moved to a smaller vat and no longer fasting!, and like that). What you are looking for is a break in the color along the line of tubes. Any positive test for ammonia in any tube reflects enough ammonia to overcome some of the 2ppm safety margin in the vat water. THE GOAL IS TO PROVIDE A 1ppm SAFETY MARGIN OF AMMONIA PROTECTION IN ALL TANKS AT ALL TIMES. Color “breaks” in tube 5 or 4 indicate a safety cushion of 1.5 to 2ppm ammonia. Re-treatment of these vats should not be necessary. Break in tube 3 reflects a 1.0ppm safety margin. This is still good, but if it is obtained at the end-of-day testing, it reflects a “trouble “ vat and it and all similarly and more heavily loaded vats will require supplemental treatment to restore the 2ppm “cushion”. Color breaks in tube 2 will need more aggressive repletion. You should never see ammonia in tube 1. That is a vat that has chewed its way through 2ppm of protection and there is now ammonia in with the fish. The professional term for this is “BAD JUJU”. The vat needs to be inspected for evidence of spawning, failure to fast, or simply overloading. The fish should be relocated if possible. About the most maddening thing in the world is to be in the middle of a titration run, concentrating on your drop count, when someone comes up to your station and starts asking you questions, yelling out numbers and otherwise distracting you from your task. Prepare signage for your table indicating an immediate and ghastly demise for anyone breaking your concentration. Mine says”DO NOT SPEAK TO THE GEEK when he is counting”.The back side of the sign has short-cut charts for the titrations. Make yourself one of these, or more. The Guests Arrive. . . .
By this time, the fish will be arriving and will be assigned to their vats, floated, benched and entered. Optimal vat loads, maximum vat loads, point scoring and load rate calculation are available on the form on the last page of this article. These values have been arrived at on the basis of a wide base of show experience at multiple shows. It seems to work better than prior estimates of vat loading from previous articles. The load ratio is a useful tool to identify those vats that are likely to use up their safety margin most rapidly, and provide a bellwether effect for similarly loaded vats. Your show staff should provide you with the number and sizes of fish in each vat. Since shows all conform to the “British Style”, no fish will be moved from its vat unless a vat is being broken down due to unusual circumstances. As the data comes in, survey the vats, determine the load and calculate and record the load ratio for each vat. Pick out one or two heavily loaded vats, one or two mid-range and one lightly-loaded vat as your target vats. As the data comes in, survey the vats, determine the load and calculate and record the load ratio for each vat. To do this, get a report from your benching crew as soon as they have data available and divide the total points in the vat by the OPTIMUM load for that vat. A 6-foot vat has an optimum load of 20, an 8-footer has an optimum load of 35. An optimally loaded vat will have a load ratio of 1.0 or less. Vats with ratios greater than 1.0 will need either closer monitoring, or some of the inhabitants will need to be relocated to another vat. Pick out one or two heavily loaded vats, one or two mid-range and one lightly-loaded vat as your target vats. 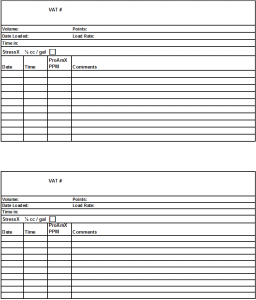 A show venue data sheet with fish size (1 through 8) and their corresponding point loads appears at the end of this article, along with a specimen vat record. A lot of what we do here seems concentrated on chemical and mathematical fiddling. If this were just SCIENCE, it’d be boring and nobody would do it. Most of what we do, however, depends on our ability to judge what the conditions in each vat are based on a number of very subjective clues. Once the vats are loaded, it is our responsibility to survey each one fairly frequently, looking at the fish for signs of stress( clamping, flashing, red fins, irritability) and at the water for signs of sloughed slime coat, poor fasting or spawning. Often, our noses are better at this than our eyes. While we’ll be routinely testing our target vats, any vat that looks “funny” will rate a test. It’s Friday night. The vats are still fresh, everybody’s tucked in and netted. No testing yet, no re-treatment necessary. Go home. Get on-site at least two hours before the show opens. Uncover the vats and survey them for problems. Full quarantine procedures apply from this point on. Do not cross-contaminate. If you come in contact with water from any vat, disinfect before you approach another. Get samples in labeled cups from the target vats and set up titration runs on them. In general, any stretch of time in excess of 8 hours will probably require a 1ppm treatment boost as a routine procedure. Plan on a 1ppm treatment for all vats every morning and at 4:00pm during the show. Additional treatments will be guided by your titrations. The exceptions will be the lightly loaded vats which may need only one or two treatments. With fish in the vats, re-dosing with ClorAm-X changes technique. Your reserve vat now becomes your best friend. Lay out a 1ppm packet of ClorAm-X by each vat, get that drill and pitcher and a whole lot of buckets. NEVER dump the powdered product directly into the vat. The fish are fasted and hungry, and will swim directly to it and slurp it down. While it is non-toxic when dissolved, in the powdered state it is lethal. Fill your buckets from the reserve tank and fill your pitcher from the buckets. Dissolve the powder in the pitcher with the drill and disperse the solution as broadly as you can into the vat. Record each dose as “1ppm” with the date and time in the “Amq” column. Now review your titrations. Color breaks in tubes 2 or 3 on Saturday AM indicate stressed vats and the need for increased vigilance and additional treatment. Throughout the day, continue to assess the vats, retesting as seems necessary. Stay out of the Judge’s way. Smile, answer questions, shmooze the vendors. Buy a T-shirt. Plan on a routine ClorAm-X boost as the show closes at 4:00 PM. Testing of the lightly loaded vats may allow you to exclude them from supplementation. Net ’em up, shut ’em down. Go to the Awards Dinner. If you are nervous about any of the vats, sneak back in to make sure everything’s okay after the Dinner before you go home. Check the air lines while you’re there. Get in two hours before the show opens-again. Retest your target vats and any others that look like they need it. Re-dose with 1ppm, guided by your titrations. Additional supplements as needed. Record as before. Start packing up. You’ve been washing out your test tubes as you’ve used them, do a final “mega-wash” and pack them away. Keep an eye on the heaviest loaded vats as the show winds down. At this point, the reserve vat that supplied water for your treatments becomes transport water to get the fish home. Try to ignore the vats where those randy little @#%$$**! spawned last night. Good job. Go home. Start working on next year’s show. My thanks to Norm Meck, who got me hooked on this craziness. References are “A Koi Show Water Quality Perspective” by Norm Meck, Koi USA, Jan/Feb 1998 and “Disinfecting Recommendations” by Spike Cover, Koi USA, July/Aug 2003. Thanks go also to Pat McCray, an actual math professor who teaches (shudder) calculus to undergrads at IIT. He looked at my math, got a headache and, after yelling at me for a while, agreed to come up with the actual REAL MATH that you see for the calculations necessary to prepare the ammonia standard. Finally, I gotta thank my water quality team at the 20th Annual MPKS Koi Show. Bob, Pat,Todd, Scot…not survivable without your help.